Far from Heaven is an ironic twist by writer/director Todd Haynes on what used to be called "women’s films." Of course, that terminology has been decried by feminists and is used by contemporary commentators at their own risk. (Even Haynes’ own publicity chooses to use the term "domestic melodrama" instead; there’s some irony right there in the avoidance of the very history on which the film’s point ever so delicately rests.) Though the terms are not synonymous, overlapping genres have been labeled "weepers" and "soap operas" and the term in current popular parlance is "chick flicks." Haynes meticulously recreates the visual world of 1950’s upper middle class suburbia and a classic 1950’s family–working husband, homemaker wife, two children, one of each gender, all living in a community where the only people of color are servants. Starting with the palette of autumn leaves (and ending with cold winter snow), the production accurately captures the cars, the hairstyles and clothes (wide skirts with many petticoats, mink stoles), and the social niceties of the time. But Haynes’ reality is a step removed from the underlying historical reality; it is stylized in the manner of the films of the period, particularly the films of Douglas Sirk (All that Heaven Allows, Written on the Wind, Imitation of Life). Sirk has his detractors (Pauline Kael used words like "trashy," "slurpy," "kitsch") and his admirers (Andrew Sarris: "hilarious comedies through the incisiveness of…dark humor"). Whichever point of view one cares to take about Sirk, Haynes’ film, so self consciously adapting a model and so obsessively recreating its style, makes its statement for an audience fifty years later–an audience saturated with the internet, movies, and television. 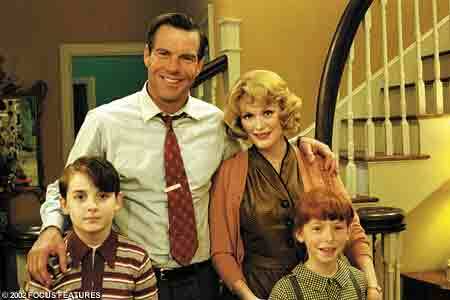 It is no accident that husband/father Frank Whitaker (Dennis Quaid) is in the television business. Having established this perfect suburban family, Far from Heaven begins its descent into the challenges of reality. Frank emerges as a repressed homosexual no longer able to keep his feelings on hold. And wife Cathy (Julianne Moore) finds herself drawn to their black gardener, Raymond Deagan (Dennis Haysbert). Though nothing untoward happens between Cathy and Deagan, just being seen talking to one another at an art exhibit sets vicious tongues gossiping with unfortunate repercussions. The plot thus gives Haynes a chance to portray the belief systems of several generations ago. Frank sees a psychiatrist where the presumption is that his homosexuality is an illness to be cured. To the sophisticated 21st century viewer, that’s so dated as to be almost ludicrous. But it was a reality then and, for all the changes wrought since, it remains widely so today. Similarly the rigid lines of racial separation (reinforced by both races) and the open racial bigotry will seem dated today, at least in the language in which it is couched. Today’s reality is that racism is still deeply etched in all too many hearts and minds. Haynes’ point is well taken. In following the style of the genre, Haynes has couched the dialogue in the rather stilted tones of his models and, in tour de force work, his actors deliver exactly the modulated, artificial emotions of those earlier films. In the 1950’s there was a conventionality to that which audiences were wont to buy into. Today, the result lends a tone of satire, almost camp, to the film, but it isn’t really funny, except in the sort of superior gloating way one might look back at a presumably less advanced time. Elmer Bernstein’s schmaltzy score perfectly enhances the overblown, period artifice of the film. All those swelling strings, though, can’t inject genuine feeling into characters that seem like perfectly costumed manikins in a store window. Haynes is clear that he is not making a "realistic" film, butthe high degree of stylization also distances his characters from the sympathies of the audience. For all the decency of the Whitakers and Deagan, and for all the ugliness of the ways their lives get upturned by small-minded social mores, it’s hard to care about any of them at all. The result is to seriously weaken the argument of the film on an emotional, gut level. It becomes a rather bland exercise in technically skilled, ultra-sophisticated high style whose serious points fade before the flash of the director’s ultimately thin conceit.